In 1951, Toyota test driver Ichiro Taira used a treacherous hiking trail to drive a BJ-Series 4x4 prototype up the side of Mt. Fuji. He made it to checkpoint 6 (7,841 ft/1.4 miles), which was the farthest that a motorized vehicle had ever been up Japan's iconic 12,388-ft volcano. The Japanese and American governments were extremely impressed by the power of Toyota's 6cyl 4x4 (remember; the Willys Jeep and Land Rover Series I only had wheezy 4 cylinders), and immediately placed orders for the Toyota BJ20 (the name stands for Type B engine/Jeep). The Land Cruiser name was adopted in 1954, and a 1955 redesign brought with it a more powerful 3.9L Type F engine (based on a GMC truck engine design), along with the now-famous FJ designation. The more refined Toyota FJ40 debuted in 1960, and it became the marque's best-selling model in the U.S. from 1961-1965. If you look closely at the 2007-2009 Toyota FJ Cruiser, you'll see FJ40 influences in the front grille, the shape of the wheel arches, and the curved rear quarter windows. But the similarities don't end there. Under the retro bodywork is the same platform used under the Toyota Land Cruiser Prado (a.k.a. Lexus GX)/Toyota 4Runner, but it's been modified to allow for 9.6 inches of ground clearance, 8-in/9-in of front and rear suspension travel, and 34-degree/30-degree approach/departure angles. This dedicated continent-conqueror is powered by the durable Toyota 1GR-FE 4.0L V6, which in the 2007-2009 FJ Cruiser, churns out 239-hp and 278 lb-ft of torque. However, there's still plenty of power to be had from this motor. So the mad scientists at AIRAID created the AIRAID 512-179 cold air dam performance intake system, and they engineered it to withstand anything the trail can throw at it. Like all internal combustion engines, the Toyota 1GR-FE 4.0L V6 has to pipe air to the cylinders, where it's mixed with the gas and ignited by a spark plug. The explosion consumes the oxygen molecules and forces the piston back down, turning the crankshaft, and ultimately the wheels. Before the air can reach the motor, it has to enter through a hole in the fenderwell, then travel up a narrow intake flex tube and force its way through a layer of dirt on the paper air filter that lives inside the air box. This limits power output because the corrugated surface inside that narrow intake tube causes the air to swirl around and heats it up. Then, all of the dirt that's collected on the 'surface loading' OE Toyota FJ Cruiser air filter, restricts the amount of air that can actually reach the throttle body. If you reduce these airflow restrictions and lower the temperature of the air charge, the additional oxygen molecules will allow the engine to extract more horsepower and torque during the combustion cycle. And that's where the AIRAID 512-179 cold air intake comes in. In place of the restrictive stock 2007, 2008, or 2009 Toyota FJ Cruiser intake system, this AIRAID FJ Cruiser cold air intake utilizes a high-flow AIRAID SynthaMax air filter that sits just in front of that fenderwell air intake hole. To keep hot engine air out of the system, that big synthetic performance air filter is surrounded by a rugged steel heat shield that mounts directly to the fenderwell. The filter and CAD attach directly to the air box with a flexible urethane coupler, which is designed to absorb vibrations and chassis flex when you're out on the trail. On top of the AIRAID heat shield a thick rubber gasket is used to seal against the underside of the hood and keep hot engine air from reaching the air filter. It also cushions against vibration and chassis flex, just like the flex coupler. 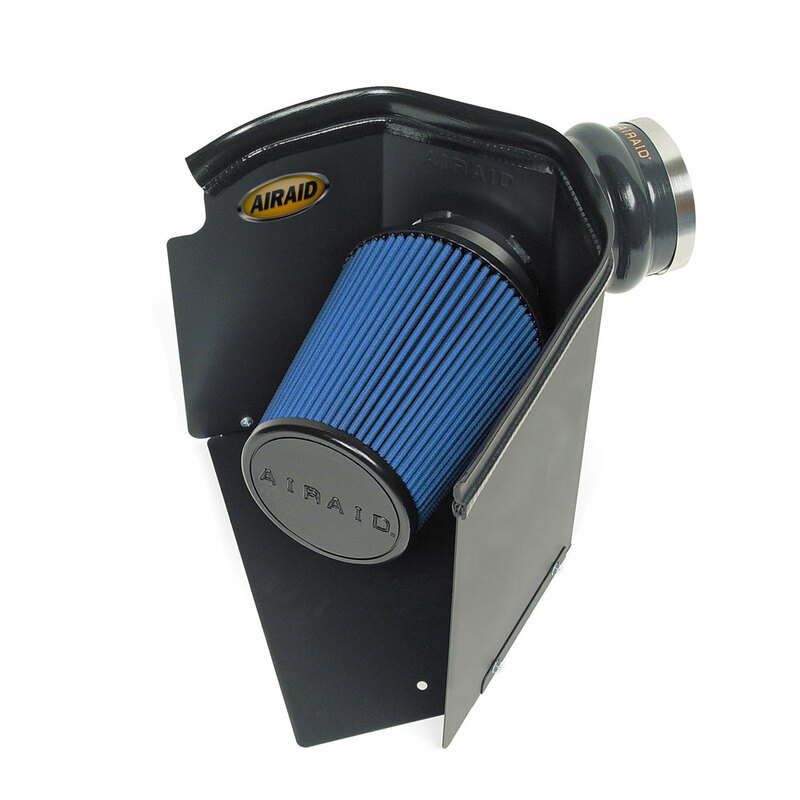 Unlike many Toyota FJ Cruiser cold air intake systems, the AIRAID 512-179 CAD performance intake system is engineered to be just as durable as the truck it's bolted to. 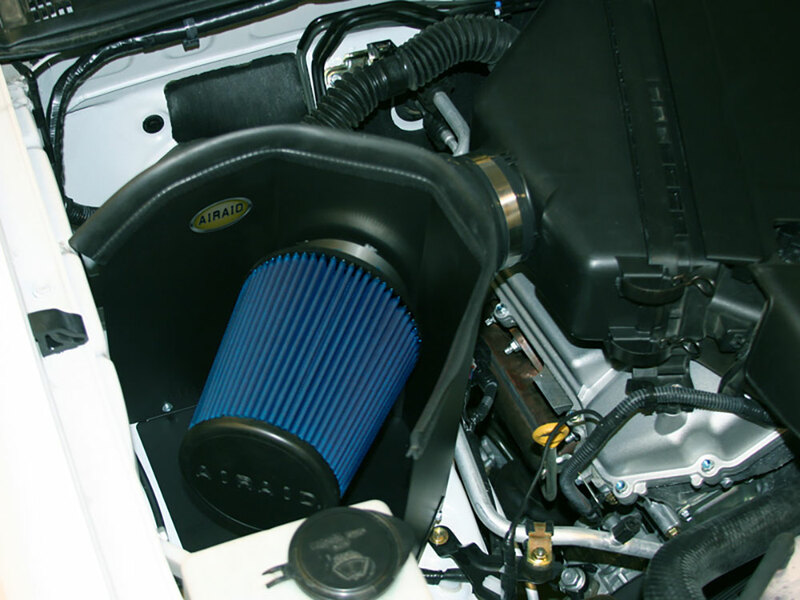 With a trail-ready mounting system in place, the oversized AIRAID SynthaMax performance air filter can provide your 2007 to 2009 Toyota FJ Cruiser 4.0L with the oxygen-rich cold air it needs to give you more horsepower, more torque, and much faster throttle response. This oil free performance air filter is made from two specially designed layers of synthetic material: 1.) The outer layer of needlefelt polyester is designed to capture large dirt and debris, for optimum filtration in wet or dry conditions. 2.) The inner layer of chemical bonded rayon/polyester features a non-woven fiber structure that stops fine dust and airborne contaminants that may not be visible to the naked eye. Whether you're driving through the urban jungle or a real one, the dual-layer SynthaMax air filter material provides maximum engine protection. In addition, airflow is significantly increased, because all of that dirt gets stored inside the material (called 'depth loading') itself. The filter won't need to be cleaned for up to 50,000 miles (depending on driving conditions). However, if you do a lot of driving in dusty/muddy/dirty conditions, we recommend checking the filter more often. And if you plan to use the FJ Cruiser's 27.5-in water fording capability, you can even get a water resistant AIRAID 799-456 filter wrap.